I love my "untried recipe" filing system. It's just a simple Excel spreadsheet, but it helps me keep track of every recipe I have pulled out of magazines, marked in a book, or snagged from the internet.They're all listed in one place, so finding something new is so much easier than it used to be. That's how I found this red beans and brown rice recipe. I am trying to eat beans at least once a week because 1) they are inexpensive; 2) they are relatively easy to make; 3) they taste good; and 4) they are good for me. But even though I have many many recipes that I like, still I want more. I am always on the lookout for a new bean recipe that will give me a new flavor profile, or combine things in ways I have not previously combined them. So I opened up my spreadsheet, sorted the recipes by main ingredient, and browsed the "bean" section. When I came to a recipe for Red Beans and Brown Rice from Lean Bean Cuisine, several things clicked into place. I have liked every recipe that I have made from this book. I have always wanted to make Red Beans and Rice. The last time I cooked beans and rice together was sometime in the mid '80s, and it was quite successful but I didn't pay attention to what I was doing and could never quite duplicate it so I pretty much gave up, but this recipe looked like it might work. I have no doubt that this recipe does not qualify as authentic to the New Orleans specialty, and I'm not terribly fond of kidney beans, so I thought I might try it with pink beans instead, something else I've been wanting to try. I bought La Preferida pink beans and, with the exception of chickpeas, they were the firmest, least mushy beans I have found in a can. They were soft and tender, but did not fall apart, which is nothing to take for granted when you are talking about canned beans. They have a nice, clean taste too. Whatever that slightly off taste is that I find in kidney beans is nonexistent here. They are somewhat similar to pinto beans, but fresher. of course, that might just be because they are new to me. The true test will be the next time I use them. Knowing that this was not an authentic N'waluns red beans and rice recipe, I felt free to improvise, mostly based on what was available in my kitchen. Specifically, I forgot that I needed a green bell pepper so I did not have one. What I did have was celery. I knew it would not impart the same flavor, but I knew it would add a component that could help to replace the missing bell pepper. I will definitely add the bell pepper next time, but I will add it to the celery - I liked the earthy flavor that brought to the beans and rice. I also added the rice to the pan before I added the liquid, and sauteed it for a few minutes before adding the liquid. Especially with brown rice, I find that coating each grain with a little of the oil helps keep it from turning into one big clump of mush. The extra bonus is that toasting the grains adds an element of warmth that elevates the rest of the flavors. I also did not feel like having a whole heap of beans and rice hanging around, so I used just 1 cup of rice, and 2-1/2 cups of vegetable broth. I could (and should) have just used 2 cups of liquid; while the flavors were there, it could in no way be considered fluffy. But it was tasty. The 1/4 teaspoon of cayenne and single teaspoon of Tabasco sauce was quite enough heat for me. The extra vegetables add some textural and flavor contrasts to the warm comfort of the beans and rice. It travels well for work lunches. And at barely over a dollar a serving, it counts as a budget item in my book. Something I think I did not mention when I talked about how I come up with the prices for my dishes is that where possible, I buy organic or higher quality, so these prices, which I think are already pretty low, would be even lower with conventional, national brands. But as I have stated before, even in this economically challenging time (especially in this economically challenging time), I want to make sure that my dollars are going towards responsible, sustainable food production. The latest beef recall at the end of October only strengthens my determination to support as many local, sustainable and organic (more or less in that order) businesses as I can. Ok, I'm stepping down from my soapbox. 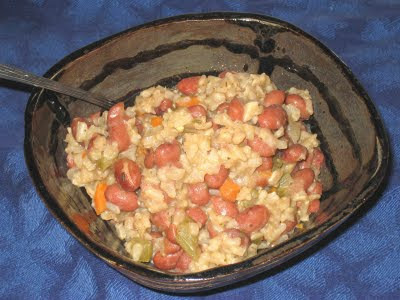 And getting ready to enjoy a nice comforting bowl of pink beans with brown rice. Heat the oil in a medium saucepan over medium-high heat. Add onion, bell pepper, celery and garlic, and saute until vegetable are translucent. Add the rice and saute, stirring frequently, until the grains give off a rich, toasty aroma and start to pop. Slowly add the water, which will splatter from the heat, and then the seasonings. Cover and cook over medium-low heat for 30 minutes. Add the beans and carrots, adjust the heat to low, cover, and cook for an additional 15 minutes or until the rice has absorbed all of the water. Fluff the rice with a fork and let sit for 10 minutes before serving.